Your Excellency, I wish to express my gratitude (NCGF), and that of the leadership of the Christian Association of Nigeria (CAN) on behalf of Christians in Nigeria for your quick response to our request for audience over the fate of Christian Religious Studies (CRS) in the current 9-Year Basic Educational Curriculum. Your prompt reaction shows how much importance you attach to this matter as of urgent National attention. I recall it was a fortnight ago we made this request. Thank you for granting us audience. In our letter, we did say, we will bring to your notice our observations, worries and fears as well as our position on the vexing issue. First, observations: we observed that Christian Religious Studies which over the years has been an independent Subject of its own was listed as part of an omnibus subject called Religion and National Values with others, such as Islamic religious studies, Social studies, Civic education and Security education. By this lumping together, in-depth study of the subject is lost to necessity of accommodation of other Subjects. Further, we observed that the content of the Curriculum and the textbooks approved by the Nigerian Educational Research and Development Council (NERDC) deliberately denigrated the person of the founder of the Christian faith. The Islamic religious studies section of the same Curriculum document impudently denied the death and resurrection of Jesus Christ, which is blasphemous - The Cardinal Truth of the Christian faith. This we consider as obnoxious, offensive and provocative. If this was limited to a private religious belief, it is understandable, but making such statements in a national document for all faiths is indeed obnoxious. We also observed that the omnibus subject called Religion and National Values is compulsory in National examinations such as JSS 3, SS 3 and NECO. The implication is that a student must offer any of the two religions as part of the overall Subject. In a situation where there is no Subject teacher for any of the two Religious Studies, the Student will compulsorily do the available, not minding whether it conflicts with his or her faith. Finally, we observed that many schools particularly in the northern part of the country deliberately refused to employ Christian Religious Studies Teachers, thereby denying the Christian students the right to choose Christian Religious Studies and indirectly forcing them to do Islamic religious studies. This we consider an infringement on their fundamental human rights. Now our fears: We consider this Curriculum a means of promoting one religion (Islam) above other religions in a multi-religious nation. We are also worried that there is a deliberate act of indoctrination of Nigerian children through the Curriculum towards Islam. This for us is the most subtle and most dangerous way of executing a jihad. We are worried by the confusion this Curriculum will create in the minds of the minors. For instance, at home a Christian child is taught that the salvation of his or her soul is through the atoning death of Jesus Christ and his resurrection. Then in school, he or she is faced with a Curriculum and textbooks denying the death and resurrection of Christ, which is a blasphemy. The worst is the portion in the Curriculum that encourages the child to disobey the parents if they oppose his or her recitation of the Koran. When an educational program encourages rebellion in the home, what will be the implications on the society? The Curriculum as it concerns the omnibus subject: Religion and National Values should be scrapped as a Subject. In its place there should be three distinctive subjects each standing on its own. They are Christian Religious Studies, Islamic Religious Studies and Social Studies, while Civic & Security Education can be combined or be made optional. Federal Ministry of Education and State Ministries of Education must be made to employ Religious Studies Teachers so that Pupils and Students will have the opportunity to study any religion of their choice in all Public Schools in Nigeria. We note that though education is in the concurrent legislative list, where State can decide what to do, since all teachers in Public schools are being paid with tax payers money, majority of which come from the Federal Allocation, there should be no discrimination on which Religious Teachers to employ and which ones not to. It is also pertinent to note that the Constitution is supreme over any other local considerations. The 1999 constitution states clearly in Section 38 (1) and article 18 of the Universal declaration of Human right that “Every person shall be entitled to freedom of thought, conscience, and religion, including freedom to change his religion or belief, and freedom (either alone or in community with others and in public or in private) to manifest and propagate his religion or belief in worship, teaching, practice and observance.” In addition, in any situation where there is a conflict between the State and Federal values even in a concurrent list, the doctrine of “covering the field” supervenes which gives the Federal authority the edge in such a dispute. The Christian faith has suffered monumental damage caused by the publication and circulation of the Curriculum. We consider the Curriculum libelous and demand unreserved apology from the Federal Ministry of Education and Nigerian Educational Research and Development Council (NERDC). We demand immediate reinstatement of Christian Religious Studies (CRS) in the Curriculum of the States' Ministries of Education in the States that have delisted it from their school Curriculum, particularly, Kwara and Niger states, and most states in the North. l would like to bring to your notice sir as you may well be aware, several states in the North since the 80's have stopped employing CRS Teachers in their public schools, some even went to the extent of coercing and flogging Christian children who refuse to do Islamic Studies. A very recent example came from your very home state, Kwara. We demand that Christian Association of Nigeria be allowed to provide Christian Religious Studies Teachers in each of the states that claim they are unable to source and recruit Christian Religious Teachers. In fact in Niger State, Christian Association of Nigeria in the past decade had had a running battle with successive state governments over the employment of CRS Teachers in Public Schools. At a point, CAN volunteered to pay the salaries of the CRS Teachers, which was declined by the state authorities. We demand that the Curriculum be Redesigned to reflect true Christian values for our children, not humanistic social/ moral instructions, but that which teaches them to love, respect and reverence the God of their fathers JEHOVAH Elohim, who sent His only begotten Son Jesus Christ to die for our sins, whose resurrection gives us passport to Heaven. Genuine respect for our Constitution which in section 38 (1) guarantees freedom of worship and right to choose what, when and how to worship as well as Article 18 of Universal Declaration of human rights. Abolition of obnoxious laws that infringe on freedom of worship, like the one recently promulgated by the Kaduna State Government. The involvement of all stakeholders in the review of the Curriculum such as CAN, Nigeria Christian Graduate Fellowship (of which I am the National President and have played key roles in advocacy over this and similar issues), PTA's of Schools and Private schools proprietors. NERDC should not at their whims and caprices hand-pick those to participate in the review. Offensive items in the Curriculum that are blasphemous should be expunged as step to restoration of mutual respect. Morally degrading items should be removed from the Textbooks for use. NERDC should make available list of recommended Textbooks in the Curriculum to the public. There should be restoration of key subjects like History, Geography in our basic education Curriculum. Government should not in practice nor be seen to interfere or promote one religion to the exclusion of others by sponsoring only a particular group or allocate State resources to it. There should be prosecution and arrest of all agents of hatred and murder of Christians in Nigeria: Two recent examples were that of Mrs Eunice Olawale, a member of the Redeemed Christian Church of God, who was killed in Kubwa, Abuja last year and that of a 74 year old Bridget Agbaime of Imo State killed in cold blood in Kano last year. It is trite to remind your Excellency Sir, that the Villains were exonerated for no genuine reasons at all. 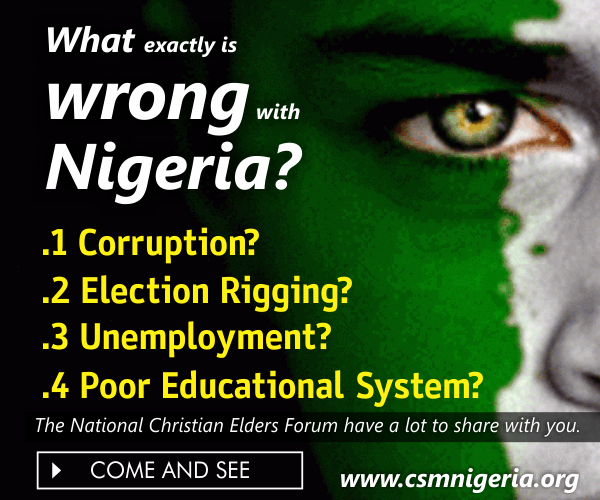 Let me add that in listing all these demands, we consulted widely with all Christian groups, associations and affiliations both in Nigeria and the diaspora, and all these points represent the opinions and positions of the vast majority of Nigerian Christians. We demand for the arrest, prosecution and stoppage of kidnapping of under aged Christian girls and forceful marriage of such in the Northern part of Nigeria. The school uniform is part and parcel of the curriculum, we therefore demand for security reasons, an end to wearing of Hijab in Christian Schools in Nigeria as seen and legislated in Osun State. Another issue which we will like to draw your attention to, is the Draft Document by the NUC (Nigeria University Commission) in which Arabic studies is now considered as a Compulsory/Elective subject in the Management Courses like Economics, Accounting, Banking / Finance and Actuarial Science as well as Arabic studies as a Generation Studies (GS ) course our the universities curriculum. This is a rude shock to us, absolutely incredible and as such unacceptable sir. Finally, may I assure you of the high regards of Nigerian Christians as we believe you will take steps to ensure the National Assembly will take legislative steps to redress the issues raised, and possibly call for a public hearing on these vexing issues that seem to undermine our unity and diversity as a nation. 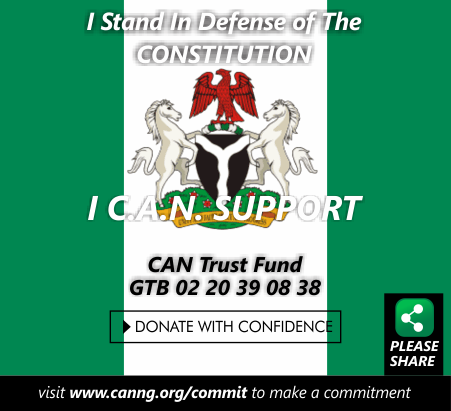 God bless your Excellency God bless the Federal Republic of Nigeria God bless the Church.